Last summer, she worked for some of the biggest names in morning television, met several celebrities and even appeared on camera a few times in front of a national audience. 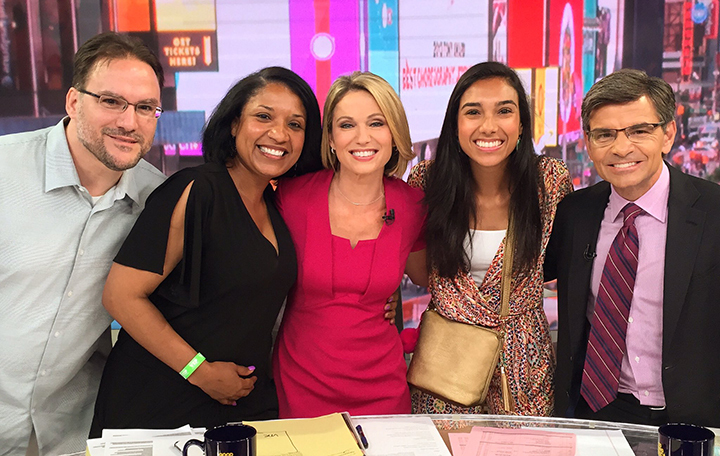 For Sierra Fox (’16), Good Morning America was the kind of internship dreams are made of. She might have been a little starstruck early on working with the likes of Robin Roberts, George Stephanopoulos and Ginger Zee, but Fox learned quickly that it takes a large crew to make a show like that run. She also learned to hold on to opportunities and resources presented to her. It wasn’t all research and books. One of the times Fox made it in front of the camera involved drinking smoothies for breakfast and reporting on how long it felt for her to feel hungry again. She also snagged selfies with Regis Philbin and record producer DJ Khaled and helped shadow bookings for stars like Kelsea Ballerini and Florida Georgia Line to appear on the show. Her work on Good Morning America helped land Fox a full-time reporting position in October at WHAG-TV, a local Washington, D.C., station serving smaller markets in Pennsylvania, Maryland, West Virginia and Virginia. She says the job gives her the opportunity to connect with the community and learn more about the surrounding area and the people living there.